This NASA graphic shows where the Ursid meteor shower will appear to radiate out from a part of the northern night sky during the 2016 Ursids peak on Dec. 21 and 22. 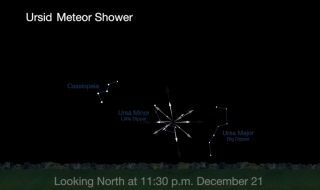 When meteor enthusiasts think of the month of December, they immediately conjure up visions of the Geminids, which over the years has evolved into the most reliable of the dozen or so annual meteor displays that take place. And yet, there is also another meteor shower that occurs during this month that in contrast, hardly gets any notice at all: The Ursid meteor shower. This year, the peak of the Ursids will occur during the predawn hours of Thursday (Dec. 22). The fact that Kochab is positioned so near to the north pole of the sky means that it almost never sets for most viewers in the Northern Hemisphere. And since the Ursids seem to fan out from this particular region of the sky, this means that you can look for these faint, medium-speed meteors all through the night if you care to. The fact that they reach their peak during the overnight hours of Dec. 21-22 at first appears to be not-so-good news — as least as far as trying to catch of view of them goes — since the moon will be at a bright, last-quarter phase, rising at around 1 a.m. local time and lighting up the night sky through all of the predawn hours of Thursday morning. However, there's a "window of darkness" where the moon will not pose any interference: The best time to watch this year will actually be tonight (Dec. 21), after evening twilight ends and before the moon rises; you’ll have about 7 hours of dark skies for meteor viewing. So this return (of the Ursids) is not totally unfavorable. This is indeed a fortunate circumstance, because the Ursids "badly need observing," according to the British Astronomical Association. It is not surprising that observers have neglected the Ursids. They almost always coincide with the winter solstice, which usually means braving cold temperatures. In contrast to the Geminid meteor shower, which can produce prolific numbers of bright meteors during the course of a single hour, the usual Ursid rate is considerably less, producing about a dozen or so moderately bright meteors per hour at their peak. They are actually the dusty debris that's shed by the periodic Comet Tuttle 8P/Tuttle, which circles the sun in a 13.6-year orbit and is not due to return until the year 2021. On occasion, the Earth has interacted with a dense, narrow stream of particles that are shed by this comet, which has caused brief outbursts of Ursid meteors numbering in the dozens per hour, such as in 1945 and 1986; counts reached 30 per hour in 2000 and again during the years 2006 through 2008. But unfortunately, no such interaction is expected this year. Still … you might want to periodically check the sky on Wednesday night. As the saying goes: "Nothing ventured, nothing gained." Editor's note: If you snap an amazing Ursid meteor shower photo you'd like to share with us and our news partners for a possible story or image gallery, send images and comments to us at: spacephotos@space.com.